A couple of months ago I mentioned how KillHouse Games, developer of the rather lovely tactical SWAT title, Door Kickers, had something brewing… and in cooperation with PixelShard no less! All we knew at the time was the title (Door Kickers: Action Squad), and a tiny handful of details. That changed mere hours ago, what with the game hitting Steam and all, and I’d say they just might have another hit on their hands here. Based on available details, its trailer and screenshots, that is, as I have yet to actually play the game myself. But honestly, the trailer alone was enough to sell me on this one, as it looks just the right amount of ridiculous – that is to say, completely and utterly insane. Even more so when played with a friend, because… well… let’s just say explosives are unable to tell friend from foe. Kaboom? Kaboom. That said, it is still Early Access – and will be until at least July 2018 – which means stuff is likely to change/be added along the way. A fourth playable class, a level editor, more levels and more ‘regular’ enemies are all planned for later implementation. 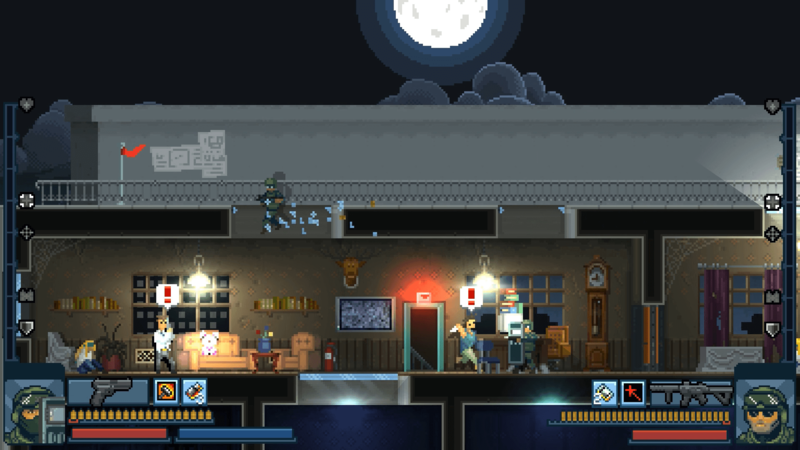 We used Early Access for our previous release – Door Kickers (2013-2014) – and it proved that shaping the final game together with the community, involving the players, listening to their feedback and ideas – while keeping your core design in mind – is the best way to produce an enduring and genre defining game. What you do get at the time of writing, however, is – surprisingly enough – both single AND multiplayer, 24 levels to wreak havoc in, laying waste to 8 different enemies and… 3 different mission types. Plus much more. Quite a bit for a game still under development (and definitely more than most Early Access releases these days). Just keep that Early Access tag in mind as you go about kicking down, blowing up and blasting away doors. After which hostages are gunned down and bad guys rescu– wait, other way around. Maybe? Door Kickers: Action Squad [Early Access] is available from Steam, carrying a $11.99 price tag.